Our flight leaves tomorrow morning for Tampa. Sunday is the big game. The Tampa Bay Buccaneers v. The Green Bay Packers. It will be so nice - Flordia's palm trees, beaches and warm weather! Our friends flew to Florida earlier this week and are going to to the game with us. They will be cheering for the Packers and we will be cheering for the Bucs. 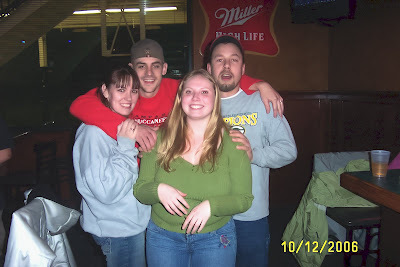 The four of us drove down for a Packer/Buccaneer game back in 2003. Here are the boys building sand castles on the beach. While us girls basked in the sun/shade. Aaahh! To get away, even just for a long weekend. I can smell the salt water now. I was getting ready to put on Cameron's pajamas when Mitchell discovered his belly button (he has an outie). It was way too cute! He kept trying to poke and pull it and Cameron was getting irritated and kept pushing his hand away. December, 2006 I was searching online for more information about Nutrivene and stumbled upon an online forum of amazing people who all have something in common - they all love someone with an extra chromosome, and for that reason they have become an extra family. Since becoming part of this extra family, I have smiled, cried, laughed, shared and learned with so many others who have had the same thoughts, feelings, challenges and eventually acceptance as I have - all online. A group of us from this extra family met in Peoria, Illinois for an amazing weekend. Thank you Amy for planning it! There were 15 families, 2 countries, and 5 states (Wisconsin, Iowa, Michigan, Illinois and Missouri). It's Memorial Day. We packed up the house, loaded the boys full of sunscreen and went to the beach. Until we were kicked out that is! Yeah, the park ranger came and said the water is off limits on Memorial Day! We can stay on the beach but can't go in the water. Oh well, it was fun while it lasted.